Yesterday began at 4.45am, an early start but for a good reason! 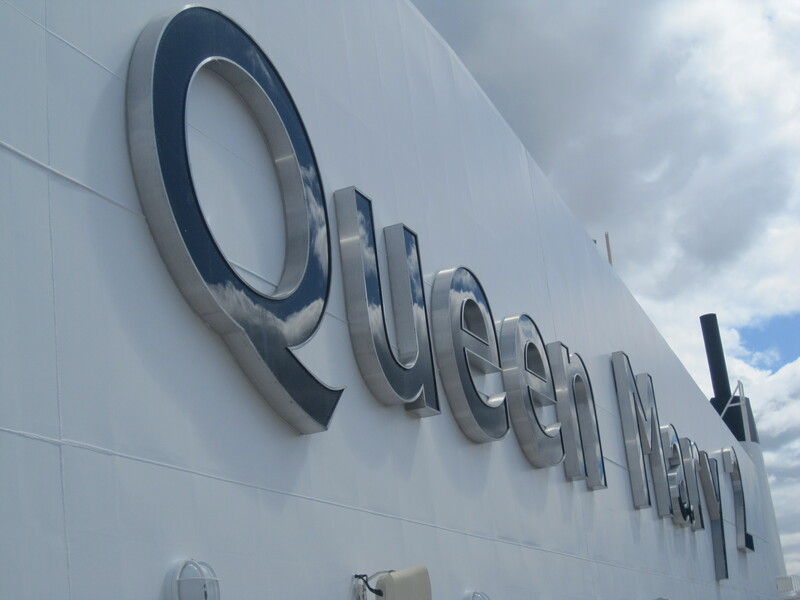 My friend and I were off to Greenock in Scotland to Visit Cunard Line’s, Queen Mary 2. First of all what a beautiful scenic drive once passed Glasgow City Centre. I have never seen such a stunning backdrop. We could see the ship for quite some distance down the road, she became grander and more dominant on the landscape the closer we got. After a brief and nerve wracking wait (I was not on the ship’s visitor list) we were finally on board. We had the opportunity to go around solo or stay with a guide but we opted for the DIY option. Always my preference on a ship visit. First impressions of her were numbing. I had been eager to get on board this ship for quite a long time so to finally be on board was a little surreal. 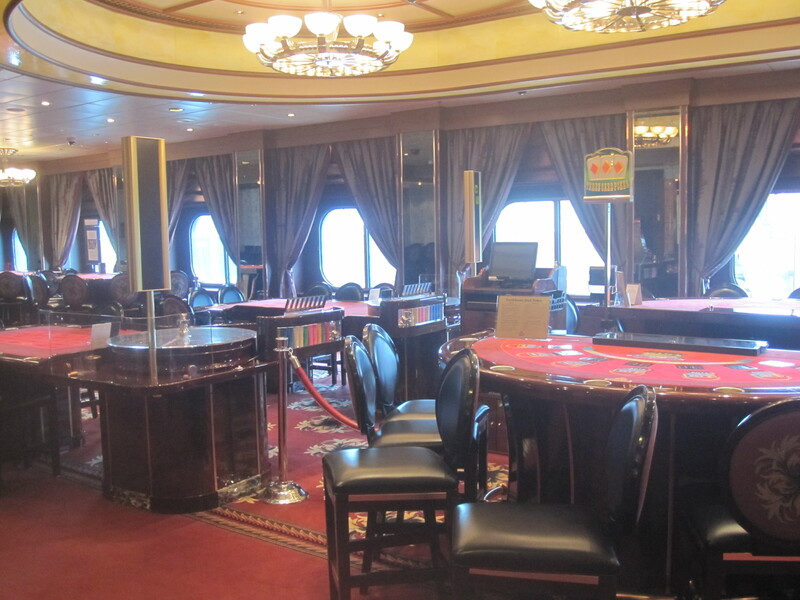 We embarked on deck 3 and were instantly drawn to the casino. It was a pretty individual casino too! It reminded me of something you would find in a ‘Wild West’ movie, it had that kind of feel about it but with more class. From here we made our way towards the Britannia restaurant, this is where we would meet for lunch later in the day but right outside was where we would find the elevator cluster, our gateway to the rest of the ship! I always prefer to start at the top and work my way down and as we had opted for the DIY tour this is exactly what we proceeded to do. We arrived mid-ships to a vast open space that was host to several tables and chairs for the small beverage section on the port side and then a fair few sun loungers for catching rays on the starboard side. It was a huge space, one I expect would be very lively on a hot summer’s day. From here we made our way down her starboard side and came across the sign, ‘Danger These Animals May Bite’. We had reached the doggy deck. Sadly the kennels were off limits but we wandered along the deck until we reached the end and were ultimately greeted by a stunning view! This is what I had been waiting to see! 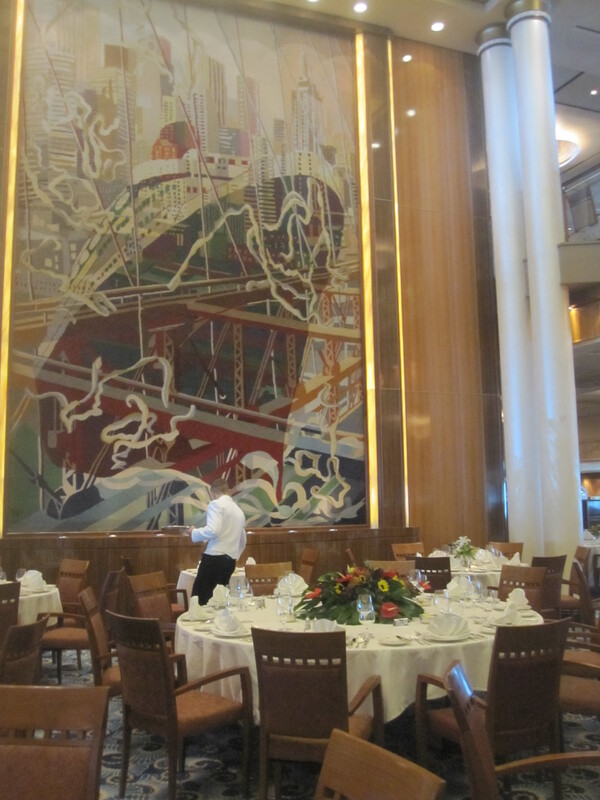 The aft section of the Queen Mary 2 is nothing short of breath taking! I could envision myself spending many perfect sea days here! It was tier after tier of inviting sun loungers, hot tubs and swimming pools. It made the aft area feel huge! Pictures do no justice, to appreciate anything and everything on this ship full stop you need to see it with your own eyes but more so her aft. After taking in all the different tiered decks we made our way back inside and would start exploring her other areas. 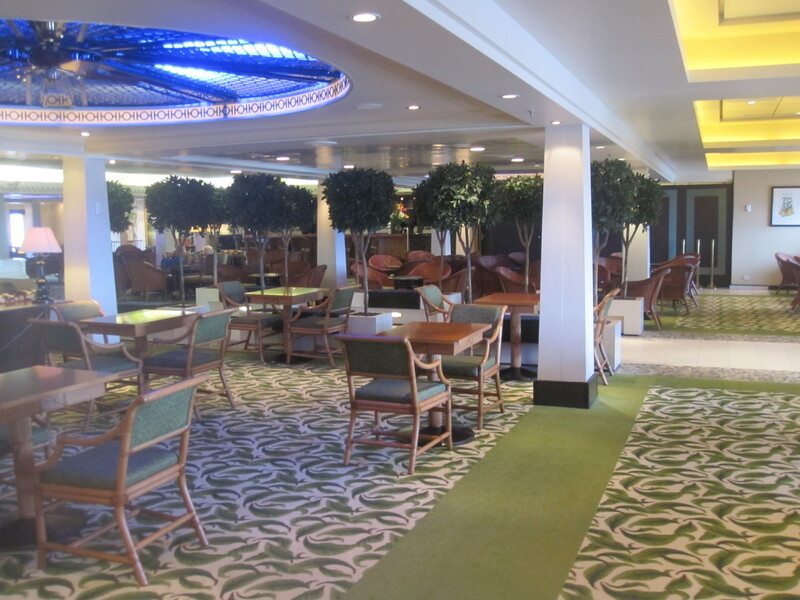 We had a quick peek in the Princess Grill then made our way through The King’s Court which was a buffet style dining option and then side stepped into the Chef’s Galley which was home to a small burger bar café. We next entered the Winter Garden which would remain my favourite inside space to sit and relax. It was bright, full of character and the waterfall that covered one entire wall set the tone perfectly. It was quite a large area too and the crisp white piano in the centre added just that extra little touch of glamour. There were a few passengers using this space when we passed through, more than I came across in any of her other public areas. Our look around the Canyon Ranch Spa was quite a brief one. There were a few people using the various facilities and I never like to intrude for the sake of a photograph so we had a peek here and there and left it at that. What we did see was very nice and the gym seemed to go on forever! As we made our way to our next stop (the Planetarium) we were met by the famous ‘Stars On board’ wall of fame. I didn’t have time to stand and read every single one but I really liked the fact we stumbled upon it, it brought a smile to my face and it was heart-warming to see all these familiar faces that have graced a Cunard ship over the years. They included Walt Disney, Ella Fitzgerald and the Kennedy’s. The Planetarium/ Illusions was actually slightly larger than I had expected. It doubles as the planetarium and a small theatre so the seating was in two different colours. All seats were suitable for watching a show but only those adorned in the red material would offer the best view for star gazing. I would actually really like to see this in action one day. I find it very interesting. The Royal Theatre which was the one I really wanted to see was sadly out of bounds as there were rehearsals taking place. We did manage to squash our faces against the glass and have a brief spy at the going’s on but to be honest it was so dark you could barely make anything out aside from the stage props. Once 12.25 arrived it was time to head back to the Britannia restaurant for a three course lunch. The service was wonderful and the food delicious. I opted for the Courgette soup to start and then the Poached and Roasted Corn-fed Chicken Breast as an entrée followed by a Dark Chocolate Fondant for Dessert. I really did enjoy the Chicken I have to admit. It was served with asparagus spears, baby spinach and wild mushrooms and it all sat nicely on a bed of celeriac and truffle puree. After lunch it was time for a quick cabin stop before disembarkation. We had the pleasure of viewing a Queens Grill Cabin, which was very nice indeed, smaller than I expected but very well decorated. The bathroom was a good size as was the walk in wardrobe and kitchenette type area as you first walked through the door. We also viewed a balcony cabin and an inside cabin. The same decoration ran throughout all the cabins which was nice. They were a decent size and far nicer than some standard inside and balcony cabins I have seen in my time. 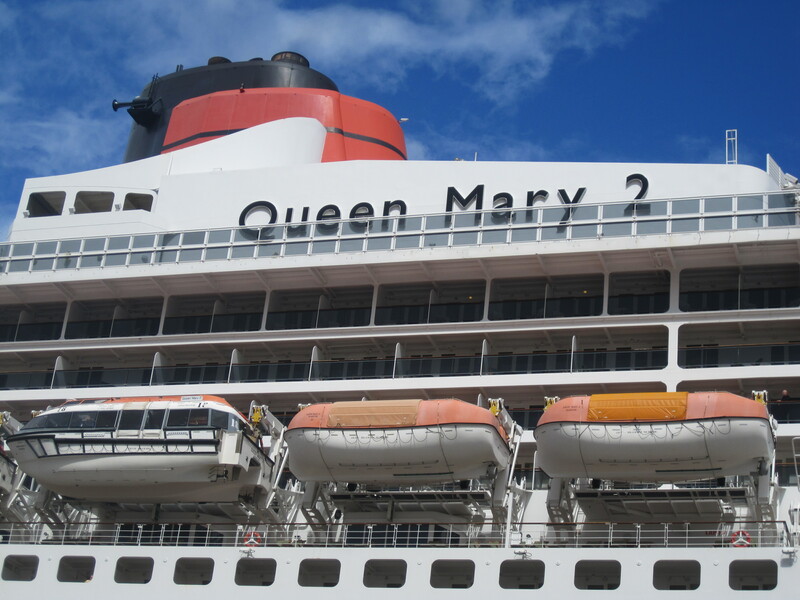 Overall the Queen Mary 2 is the ULTIMATE vessel! She has more space on board both inside and out than any other ship I have been on. Her interior design is an art deco enthusiast’s paradise and I really did feel like I had gone back in time the moment I stepped on board. She has soul and character and she is entirely her OWN. A trait I think many of today’s vessels struggle to achieve regardless of how unique their features. She is dated to a specific period in time in many ways but her touches of modern life and glamour brings everything together perfectly. I do think however that in certain sections the colour of the carpet clashes with that of the walls, but in the grand scheme of things I can live with that. I have been nominated in the ‘Best Cruise Blogger’ category in the Cruise International Magazine Awards. 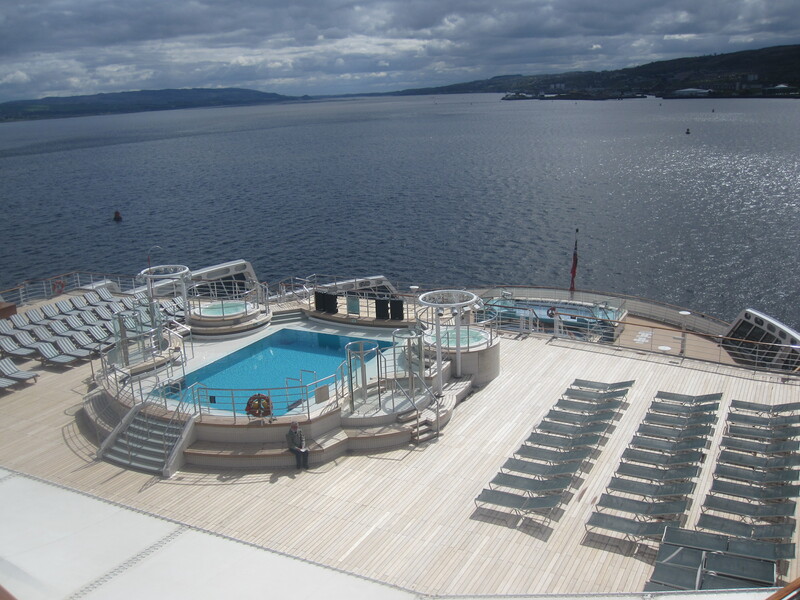 If you enjoy the CruiseMiss blog then please cast your vote. You can vote for your favourite cruise lines too!